Question of the Week: Why do brains have wrinkles? The brains displayed at the entrance of the Grant Museum are mostly mammal’s brains but we can observe differences in sizes and in how smooth or wrinkly they are. The folds of a brain are called gyri and the grooves are called sulci. These morphological features are produced by the folding of the cortex, the part of our brain responsible for higher cognitive processes like memories, language and consciousness. During development, all brains start off with a smooth surface and as they grow, gyrification (the development of the gyri and sulci) occurs. It is interesting to note that the major folds are very consistent amongst individuals, meaning that development is similar sometimes even amongst species. 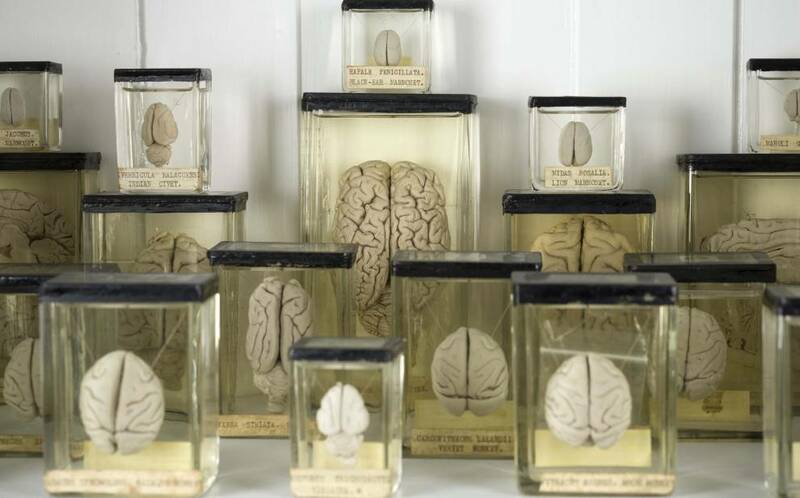 The brain collection on display at the Grant Museum of Zoology (Image credit Grant Museum of Zoology). It has been assumed that the wrinkles in brains correlate with an animal’s intelligence. The reasoning behind this is that a bigger brain, and hence more neurons, need more space. The folds allow the cortex to increase its area while being packed in a confined space like our cranium. There are several factors and hypothesis of how gyrification occurs. Recently, researchers at Harvard developed a 3D gel model based on MRI (magnetic resonance imaging) images to understand how this process occurs. They found out that it all boils down to the mechanical properties of the cortex. While neuronal cells grow and divide, the increasingly bigger brain leads to a compression of the cortex and to the formation of the folds. The researchers were able to mimic the folds of the cortex and were stunned at how similar their gel model looked to a real human brain. Gel model of a foetal brain (Image credit: Mahadevan Lab/Harvard SEAS). Even though most of the brains on display in the Grant museum have gyri and sulci, in nature, most animals have smooth brains. 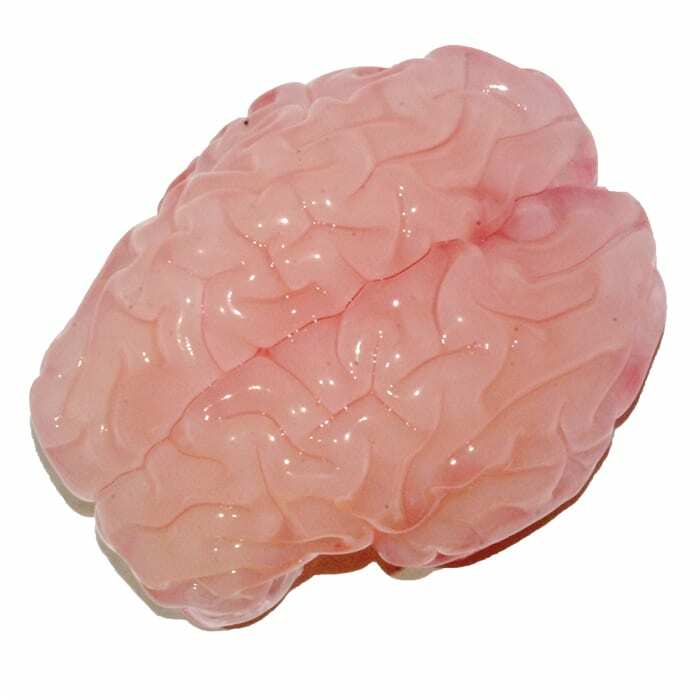 In general, larger brains have folds while smaller brains do not, even small mammals like rats or mice have smooth brains. In humans, a lissencephalic brain is one without gyri and sulci and is a result of a rare disorder that is characterised by mental abnormalities. From the collection of brains in the Grant Museum, there is only one lissencephalic brain—next time you visit the museum see if you can spot it. Additionally, try to find the brain coral. Because of its intricate maze–like pattern, Diploria labyrinthiformis has very similar ridges and grooves as a brain, and so is referred to as brain coral. Overall, I find looking at brains and their grooves fascinating, each species with their own pattern and each groove in a specific place. Makes me wonder how brain coral gets its patterns. 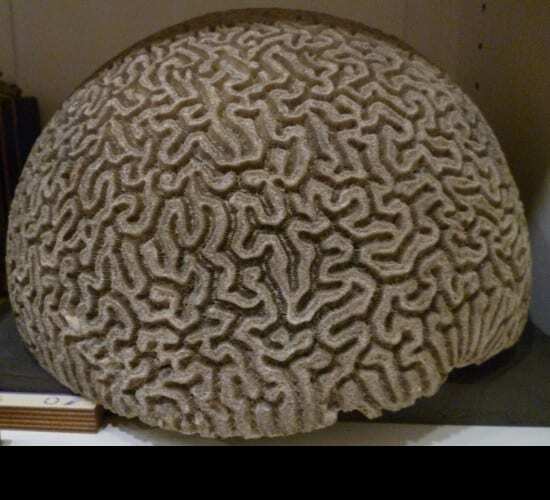 Diploria labyrinthiformis also known as brain coral(Grant Museum C1084). Roth, G. and Dicke, U., 2005. 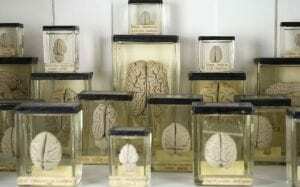 Evolution of the brain and intelligence. Trends in cognitive sciences, 9(5), pp.250-257. Ronan, L. and Fletcher, P.C., 2015. From genes to folds: a review of cortical gyrification theory. Brain Structure and Function, 220(5), pp.2475-2483. Manger, P.R., Prowse, M., Haagensen, M. and Hemingway, J., 2012. Quantitative analysis of neocortical gyrencephaly in African elephants (Loxodonta africana) and six species of cetaceans: comparison with other mammals. Journal of Comparative Neurology, 520(11), pp.2430-2439. Probably corals also need to have a large surface to volume ratio, but in their case to maximize their filtering area?